Fly and Fin: Shad fishing taking up the net above Chester, N.J.
Shad fishing taking up the net above Chester, N.J. Here is a splendid drawing I found in the Library of Congress's digital collection. 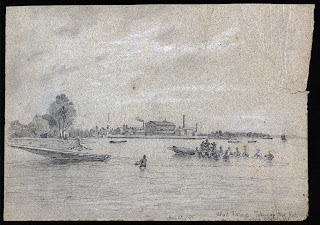 Fishermen are standing in the Delaware River (1855), netting shad along the shore. 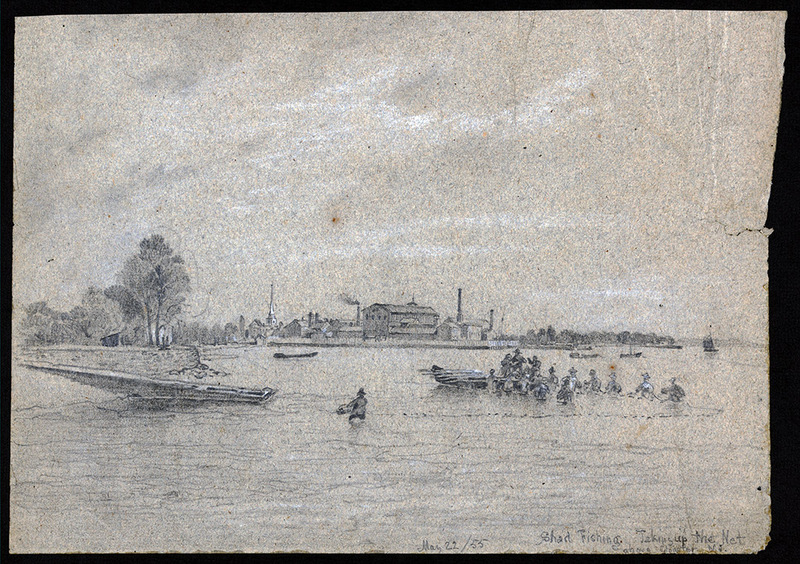 The artist is Queen, James Fuller, 1820 or 21-1886, and the drawing is graphite and chalk ; 23.1 x 33.2 cm..
Chester, N.J. is not the Chester of Morris County, but Chester Township, one of Burlington County’s original townships now Borough of Palmyra (if my research is correct). I'd played with the drawing in PhotoShop to bring out some of the detail and if you like the see the original click this link: (http://www.loc.gov/pictures/item/2009632254/). REGAL VISE-The World’s Best Fly Tying Vises and accessories. Expanding the possibilities of fly fishing through improved fly design. Follow Fly and Fin on Twitter. Salmon fishing on the Dee. © 2010 Fly and Fin: All photographs on this site may not under any circumstances be resold or redistributed for compensation of any kind without prior written permission from Lou DiGena. © 2011 Fly and Fin. All rights reserved.. Powered by Blogger.